If this is something that's continually accessable, can the FAQ/help page include a link for that, and not just how many of each badge has been earned by others on the site? 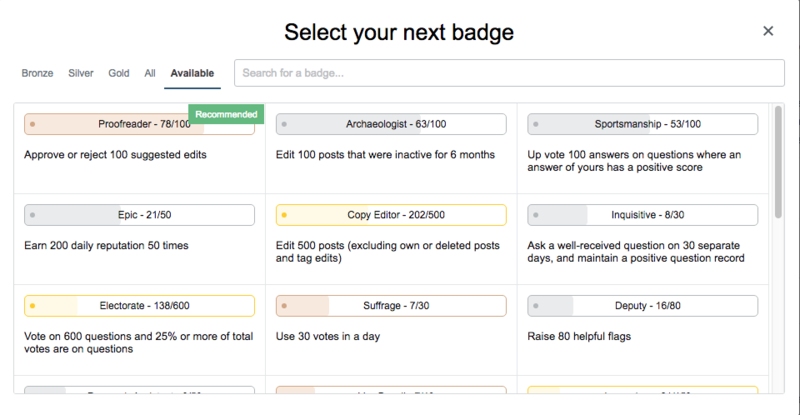 to see your progress towards badges, click here! That page cannot be customized per site, as far as I know. However, this does sound to me like a reasonable suggestion. You may want to consider bringing it up on Meta Stack Exchange, which is for network-wide issues. Go to the Activity section of your profile. You can reach this by clicking on your total points in the upper right hand corner of every page. To see progress on some badges (not all), click on the wheel by "Next badge" on the right side of the picture. To see progress on tag badges, click on the wheel next to "Next tag badge" on the left side of the picture. If that isn't visible, then click on a nearby wheel to toggle "Next tag badge" with "Next privilege." The popup for badge progress looks like this. Don't worry about choosing one to track. I just X out of it when I'm done. Here's how you can track it: there is "Reputation" square at the top of your "Activity" page. Its default setting is set to track your next privilege, and only switches to tracking tag badges once you've gained all privileges. But you can manually set it to track tag badges instead of privileges. Click on the gear icon next to the reputation required for the next privilege, and it offers you to "choose between tracking your next privilege and a tag badge".